Why Buy a Deli Knife? By Chef Tony Matassa, ShoppersChoice.com, LLC. Ever wonder what a deli knife was or why you would need one? Well let me answer those questions for you right now. A deli knife is a must have kitchen tool for any sandwich enthusiast. A sandwich is more than a quick meal, it is a work of art. If you ever wanted to know how restaurants cut their sandwiches so perfectly, the secret is a deli knife. Everyone knows that the more ingredients that you put into a sandwich, the harder it is to slice cleanly. Your standard kitchen knife will probably be able to cut your sandwich no matter how thick it is, but to achieve a perfect cut without fraying the bread or tearing up the ingredients you will need a deli knife. Deli knives are known for their unique design, most often having the entire blade offset from the handle and having a razor sharp serrated edge. The offset handle allows you to easily slice through thick sandwiches piled high with meat and vegetables, without having to smash your fingers. 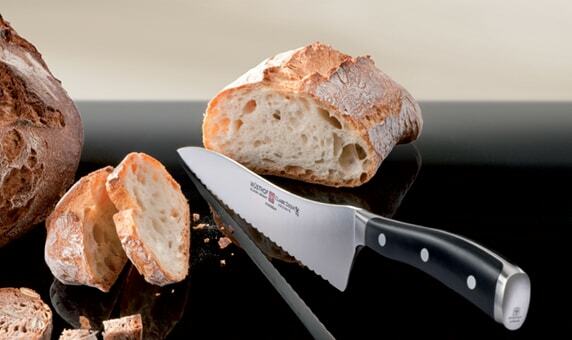 The serrated or scalloped edge lets you cut through even the hardest of European breads with ease and it cleanly cuts through meats and veggies without tearing. It is recommended that these blades be used with wood or plastic cutting boards to ensure a long life for your knife.